St. Blaise was a physician, and Bishop of Sebastea in historical Armenia, now modern day Sivas, Turkey. According to early Church records, he was martyred by being beaten and then beheaded. He blessed throats and effected many miracles according to his hagiography. Many times he is pictured with crossed candles, and they are still used to bless the throats of the faithful on the Feast of St. Blaise today. The first reference we have to him is in manuscripts of the medical writings of Aetius Amidenus, a court physician of the very end of the 5th century. It is in these writings that his aid was invoked for treating objects stuck in the throat. He cured animals and lived in a cave. Legend tells us that before he was martyred, he spoke to a wolf and told him to release a pig it was intending to harm, and the wolf listened. St. Blaise was going to be starved but the owner of the pig secretly gave him food in order to survive. Eventually he was tortured and beaten with wool combs and then beheaded for his Christian Faith. He died in the year 316. 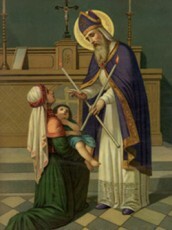 St. Blaise’s following became widespread in Europe in the 11th and 12th centuries. St. Blaise is also one of the “Fourteen Holy Helpers” or Auxiliary Saints and his legend is recounted in the 14th century “Legenda Aurea”. He is also the Patron of the Armenia Order of Saint Blaise. St. Blaise’s remains rest at the Basilica in the town of Maratea, Italy. His holiness was made manifest through many miracles, from all over, people would come to him to find cures. He cured them both body and spirit. Even wild animals came in herds to receive his blessing. St. Blaise was a physician and also a Bishop in the early Christian Church. He had a strong faith, and his holiness was made manifest through many miracles. He was noted for blessing throats, and specialized in saving people from choking to death on fish bones. He holiness not only drew people from all around to be healed in body and soul, but also animals would come in herds to receive his blessing. He refused to denounce the faith, and was beaten and beheaded as a martyr for the faith in the year 316.